Fidelity is a key quality in any recording. In most cases, especially that of recorded dialogue, the idea is to reproduce as sound that feel as close to natural speech as possible. 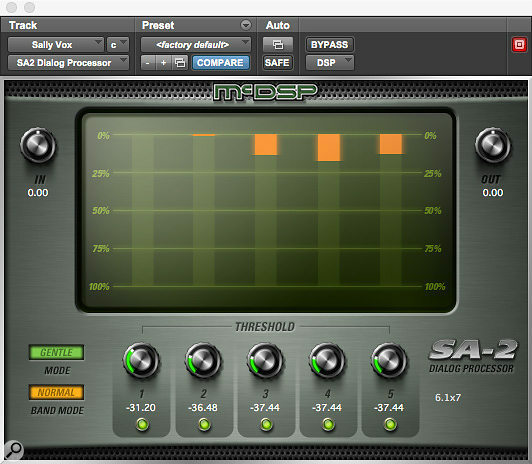 Enter the McDSP-SA2 Dialogue processor plug-in. Modelled on a unique hardware used my premier Hollywood sound engineer, Mike Minkler, the McDSP-SA2 is marketed as an active equalizer plug in for your Digital Audio Workstation, although the software offers much more than just equalization. The main job of the McDSP-SA2 is to ‘improve the overall sound of recorded speech’. Whilst trying to brighten up the sound of dialogue recording in film, Minkler was vexed by spike in the frequency spectrum making the dialogue sound unnatural and, well, recorded. With the help of an engineer, he built a unit specifically to tackle this very specific problem. The digital result of this bit of kit is the McDSP-SA2. The ‘5 bands of active equalization’ are set to very specific frequencies that correspond to common problem areas when mixing recordings of the human voice, namely spikes at around 3k, 5k, 7k, 9k, and 11k. Each channel has an adjustable threshold at which the unit begins to manipulate the signal, and there are two modular controls to choose from. The first allows users to choose the magnitude by which the signal is affected, ranging from ‘gentle’ to ‘attack’. The second allows you to control the notch width, or the specific range around the preprogramed frequency that will be manipulated. Each band has a kill switch allowing you to easily compare your equalized signal with the raw signal, and the unit features both input and output gain control for overall loudness of the audio signal. But apart from its intended purpose of improving the quality and overall sound of speech, the unit can be repurposed for a variety of jobs when recording audio of any kind. Sibilance, or an unpleasant harshness created by a rush of air hitting a microphone diaphragm when speaking the ‘s’ sound, is a problem in any recorded speech, but also when recording vocals in music production. The unit is perfectly designed to act as a ‘De-esser’, without cutting out too much of the high frequencies as some specific De-essers can. As well as improving voices, the unit is adept at improving the overall tone of many recorded instrument, especially when a mix becomes too crowded, and specific attributes of a certain instrument need to limited. And if that’s not enough, with a bit of fiddling the unit can be used as a pretty serviceable compressor, using the gain controls to boost parts of the mix that may require extra help, or gluing the whole mix together. There are two options for purchasing the McDSP-SA2. The Native version is a very reasonable £117, or you can opt for the AAX DSP version, making it compatible with the Pro Tools DAW, for £195. The McDSP-SA2 is a great addition to any studio set-up, from casual podcasting, through recording your garage band, to mixing down major motion pictures.